I’ve recently discovered a wonderful new website (just launched in January) that I’d like to point you toward today. It’s called 3 Things for Mom and its mission is to give you a unique daily blog post that’s “short enough to read over a cup of Joe,” featuring “a truth, a tip, and a find” from a different blogger every weekday. It’s a great place to step outside of your regular blog reading routine and find new bloggers from different niches. Plus, who doesn’t love a bite-sized tip and a favorite product recommendation every day? So please check it out! 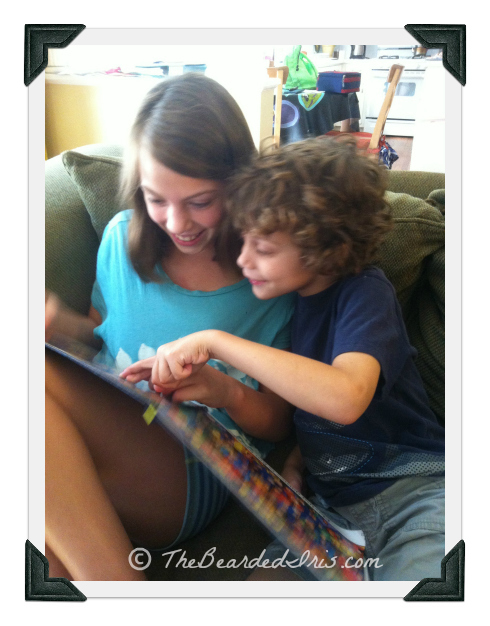 You can connect with Lauren and @3ThingsforMom on Twitter and Facebook too. Have a wonderful weekend filled with great hair, neatly cut brownies, and the ability to remove your stubborn neck hair without shedding too many tears in the process. 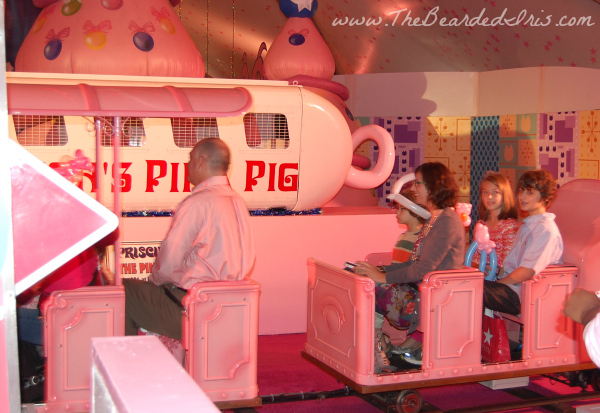 I rode the Pink Pig! 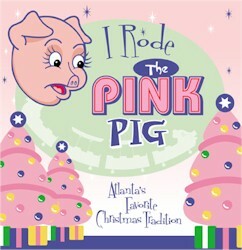 It’s the title of a cute little keepsake book which I received for attending the annual ribbon cutting ceremony of the Macy’s Pink Pig holiday train. It’s THE annual holiday tradition that Atlanta families have been treasuring for nearly 60 years. I know what you’re thinking: only in the South would they wrap a holiday ride in bacon. But come on. Bacon really does make everything better! 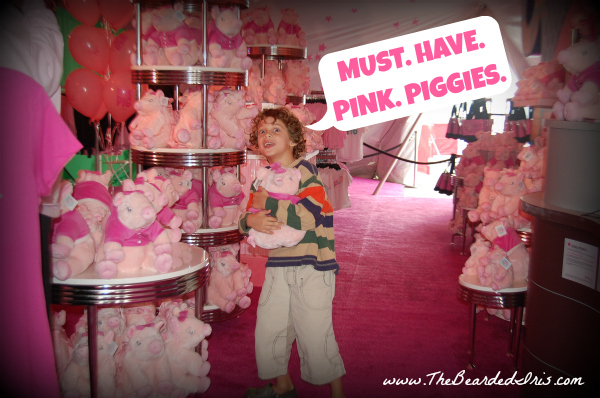 And The Macy’s Pink Pig is no exception. 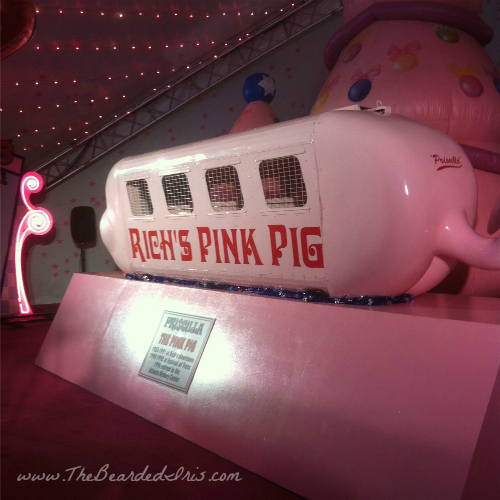 Apparently it dates back to 1953 when it was known as “Priscilla the Pink Pig Flyer.” It used to be suspended on a track above the downtown Atlanta Rich’s Wonderland of Toys. (YIKES! You could not have paid me a million pink cupcakes to get in that thing!) But over time, the ride has evolved a bit. 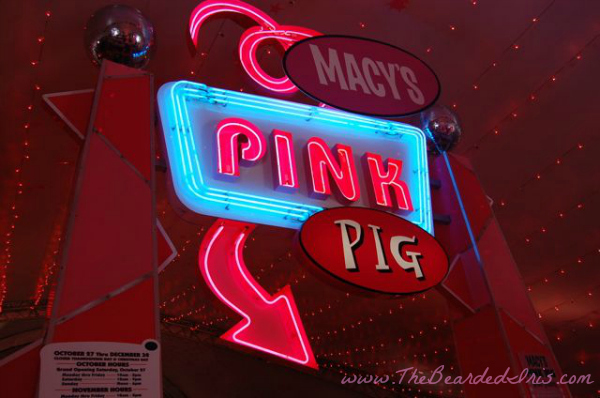 These days, The Pink Pig is no longer suspended in the air. And no longer does it resemble a pink paddy wagon. Now it’s just an open-car kiddie train that goes around a big circle (twice) like a regular kids’ choo-choo train ride. And it is as kitschy as kitsch can be. Which means I absolutely LOVED IT. My favorite part? The cheesy 1960’s game show music playing in the background. So funny! And the story told over the loud speaker while you ride the train has a great message about the importance of doing what you love and being true to yourself in order to be happy. I am clearly enjoying this more than anyone else in my train car. Truly, from the moment we got there, my kids were pretty excited. My husband? Not so much. But don’t listen to him. He rarely emotes, unless Ohio State is playing. 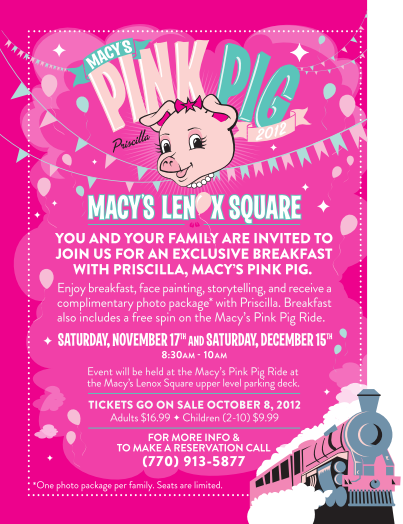 Macy’s Lenox Square is doing a special promotion this holiday season where you can eat breakfast with Priscilla the Pink Pig! There are two opportunities: Saturday, November 17th, and Saturday, December 15th. And the tickets will benefit Children’s Healthcare of Atlanta! 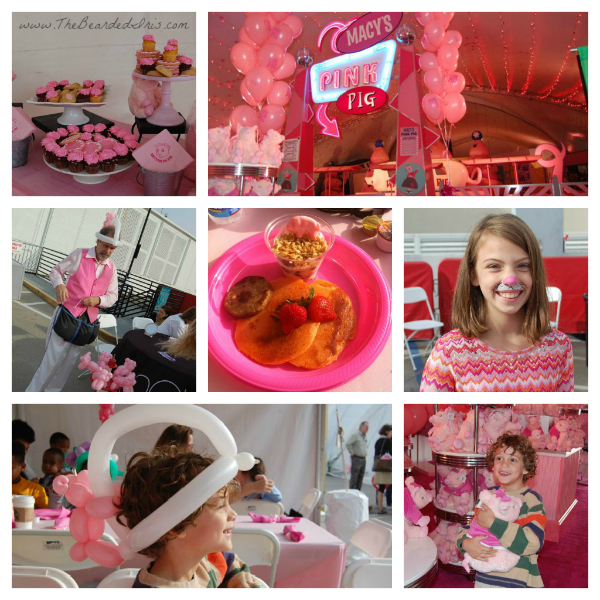 Breakfast, face painting, storytelling, endless pink treats, a spin on the train, and a complimentary photo package with Priscilla! And the gift shop? OH MY ‘LANTA! We had to pay extra for 2nd base. 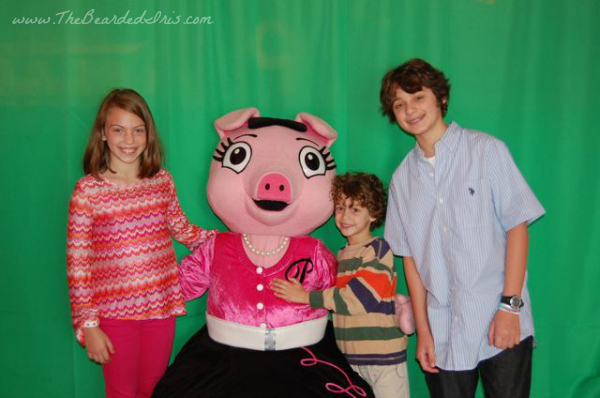 All in all, if you are looking for a fun, philanthropic, family event near Atlanta where you will be treated like a VIP and create memories your kids will treasure for a lifetime, go have breakfast with Priscilla the Pink Pig. For reservations or more info, call 770-913-5877. 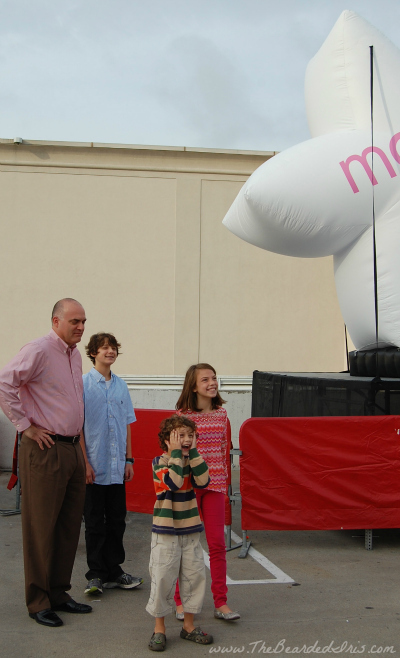 PS – It’s located on the upper deck parking lot of the Macy’s at Lenox Square Mall in Buckhead. The train and gift shop are under a large white tent, but the breakfast is served outside, so dress for the weather. Disclosure: I am a member of the Everywhere Society and Everywhere provided me with compensation for this post about Macy’s. However, all thoughts and opinions expressed herein are my own. 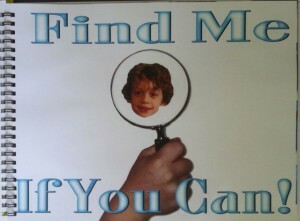 I am thrilled to announce the five randomly selected winners for the Find Me If You Can! book giveaway I posted last week! Congratulations, guys! I know your kids are going to love this book as much as Bucket Head and Mini-Me do! Be on the lookout for an email from me with details on how to claim your prize. Awwwww…don’t think like that, Boo. You’re a winner just for being here and learning about this book before it goes viral and everyone and their mother already has 3 copies. Don’t you love feeling like one of the first people to hear about something cool? I know I do. BOOOYAH! Besides, you can still get 10% off your entire order at Bammco.net by using my super secret promo code BUCKETHEAD. But hurry, that code is going to expire this Saturday at midnight. So don’t delay. And if you’re just joining us and don’t know what all the fuss is about, check out my video review of this wonderful new book that your kids are going to love. You’ll be glad you did. I get a lot of PR pitches to review and/or giveaway stuff on my blog. Most of them are pretty crappy pitches. 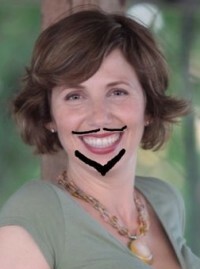 Here’s a tip, if you’re pitching something to a blogger, take two frickin’ minutes and get to know the blogger first. For instance, even though I have a goatee on my avatar, if you address me as “Dear Sir,” I jump on that delete key faster than Honey Boo Boo on a dropped Cheese Ball. Needless to say, due to the sheer volume and crapitude of most of these pitches, I rarely respond. But I received one a while back that caught my eye. It was from a couple in Ohio who makes children’s books. And thus, an email conversation began. 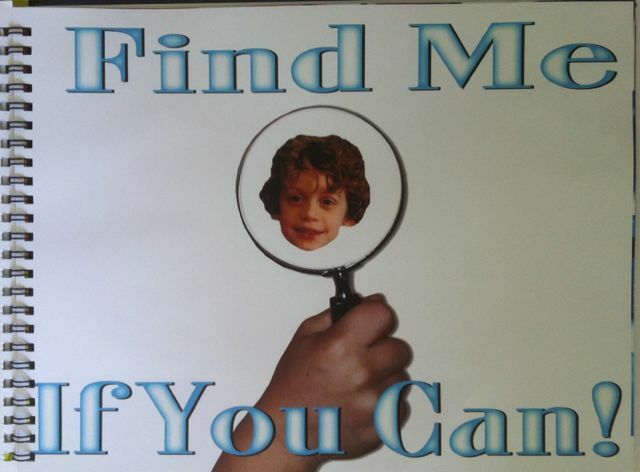 His book is called Find Me If You Can!™ Tom offered to make a free one for Bucket Head, so I checked out his website and was immediately intrigued. I decided to send him a photo of Bucket Head so I could see if I liked the quality of the book enough to want to do a review on my blog. 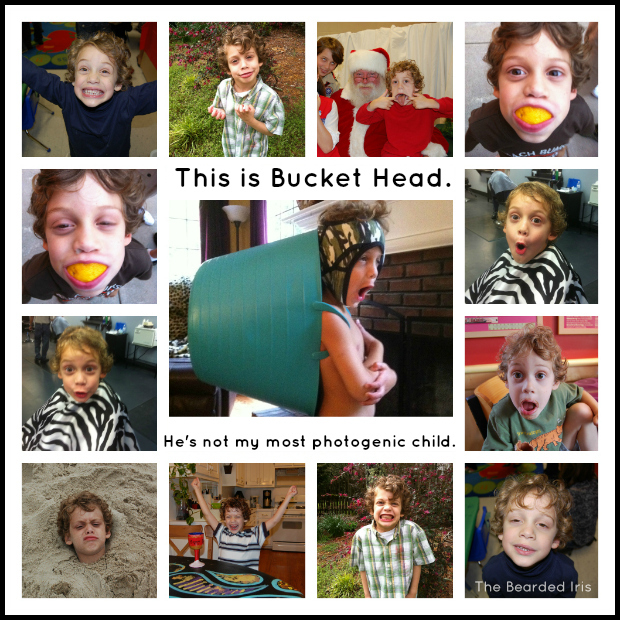 As cute as my Bucket Head is, the boy ain’t the most photogenic child I’ve ever pushed out of my baby maker. But I finally found one I thought would work and emailed it to Tom. About 10 days later I received my book. I think it will be easier for you to see Bucket Head’s reaction to it than it would be for me to tell you about it, so here—have a look. Mini-Me (who is almost 10-years-old) took one look at this book and wanted a copy for herself with her own little face on each page. My children stopped fighting for the first time all day while they worked together to find little Bucket Head’s photo on every page. Bucket Head kept going back to the book for days after he received it. I’ve done all the research for you, so let me point out some of the book’s features based on questions I’ve already asked Tom and Sue. 1.) There is a spiral binding on the inside of this hardcover book because Tom and Sue have found that to be the sturdiest option, even though it costs them more to produce it that way. 2.) Yes, if you have multiple children, you can put siblings in the same book, but it will cost a little more due to the extra labor required. 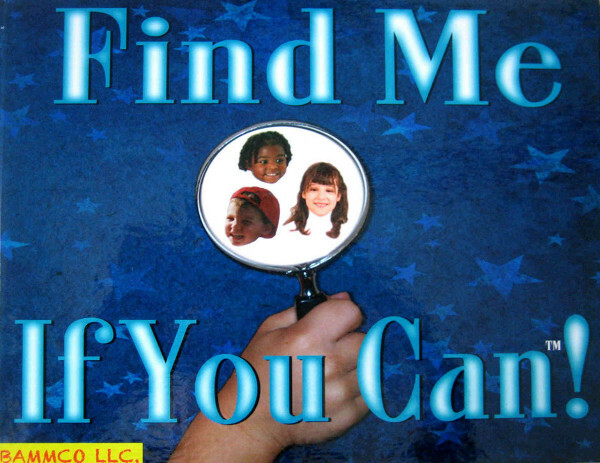 Plus, the more kids you put in the same book, the more crowded the magnifying glass on the title page will be. This is the title page in Bucket Head’s book. 3.) 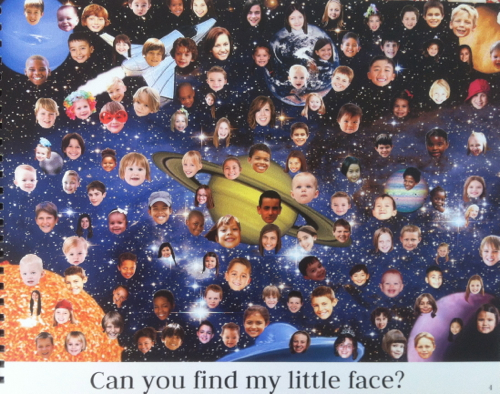 Based on the child’s age and ability, Tom and Sue can customize the number of random faces that appear on each page. 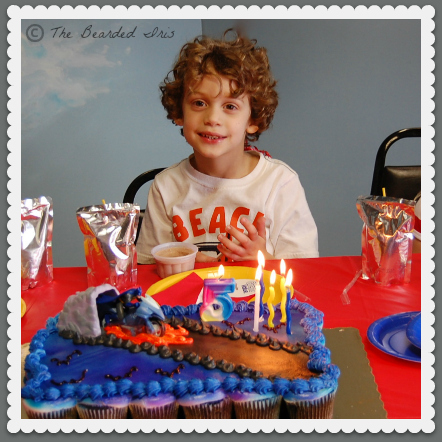 They have done as few as 12 faces a page for children with learning disabilities. My book has ~120 faces per page and it was just the right level of difficulty for Bucket Head. 4.) Don’t worry – your child’s face will not be used in other people’s books (unless you want that, and if so, you just have to sign a photo release form). The books are $29.99 each and cost $4.95 to ship anywhere in the USA. For a limited time only (the next 7 days), Tom and Sue are offering my readers a special 10% discount ($3.00) on each book. Just go to BAMMCO.net to place your order and use the promo code BUCKETHEAD. Tom and Sue have also generously offered to give away 5 of these books for FREE (with free shipping) to 5 of my fabulous readers! I’ll announce the winners next Wednesday. If you are a blogger and would like a free personalized book to review on your own blog, please email me at Iris <at> TheBeardedIris <dot> com and I’ll introduce you to Tom and Sue. 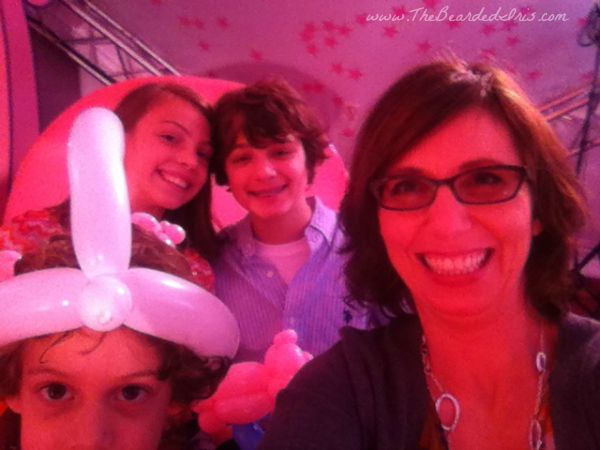 PS – I’m creating a photo album on Facebook so we can post the worst photos of our kids. 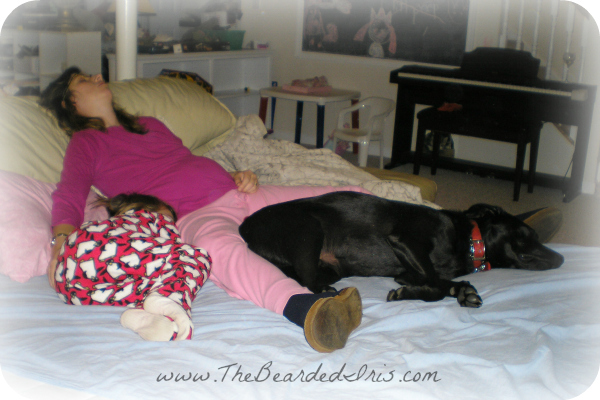 Please join me at The Bearded Iris page to share yours. Disclaimer – I received a free book in order to personally experience it for this review. As always, all opinions are my own.